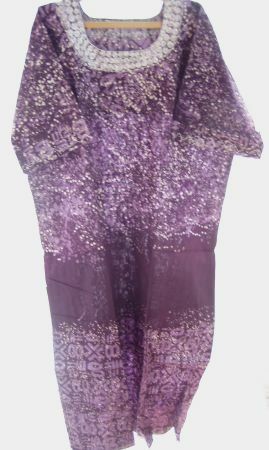 Purple Sky is a long 100% cotton dress. It has a cap sleeves and a beautiful 2″ display of embroidery around the neck and a thousand bubbles top and bottom. There are 8″ kick pleats on each side. Cool and breezy one size fits most all. It measures 28″ across the chest when flat on a table and 51″ from the shoulder to the hem.